Several years ago (2010) I was on the Dartmouth side of the harbour taking photos with my two oldest great nephews. We stopped at the Woodside Community Centre and walked down to the shore. 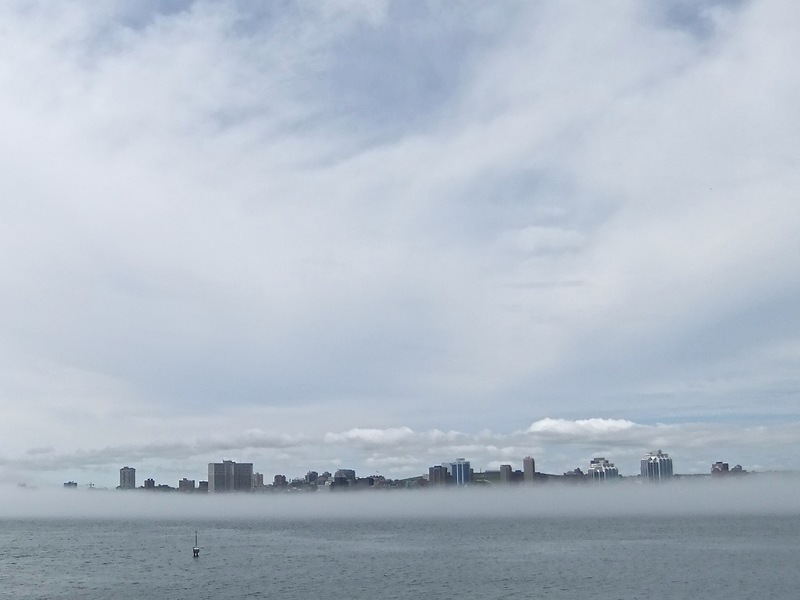 The harbour was shrouded in fog but the Halifax building tops rose above the fog and the low clouds were well defined on this dullish day. I filed the image away as one of my better photos. I came across it a couple of months ago while perusing photos looking for images that might be suitable for wall art pieces. I stashed this one in that folder. I enlarged it a bit, printed it on fabric and today I began assembling it. So far I have a base image, with a narrow inner border and piping. I’ve chosen fabric for the wide outer border. I haven’t yet begun any thread painting – I have a feeling this is one of those situations that wants less, rather than more. The challenge is I can’t take out stitching once I’ve done it because the needle holes show. So each stitched element has to be carefully thought out. I’m also still working on Morning Conversation but today this image called out to me so I worked on it instead. I worked on the piece quite a bit filling in background – It’s just about there. I think I’ve decided I’m not going to use the fusible vinyl on the windows – it’s just too difficult to apply successfully and I think even though the vinyl I bought is “matte” the shine will detract from the two men. 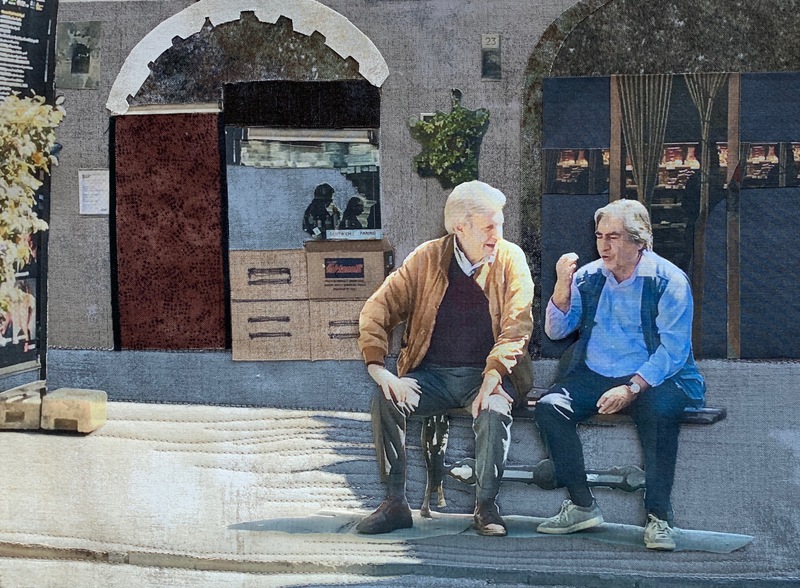 I’m still debating whether to thread paint the background elements completely before adding the men – I will end up with stitching underneath that may show but the stop/starts of thread lines would be smoother because they’d be hidden beneath the final appliqué. I guess I can start on the left of the piece and get as far as I can there, then decide. I’ve walked around this piece for more than a week! There are still several decisions I haven’t been able to make and that stopped me from doing anything. This morning I pushed myself to do something. I’d chosen fabrics last week – today, I finally started creating templates for each element, cutting it out and fusing it to the base. The gents and the sign/bush on the left are simply laying in position – they’ll be among the last elements to be fused in place. But I wanted to get a sense of how they look against this background and I’m doing OK so far. 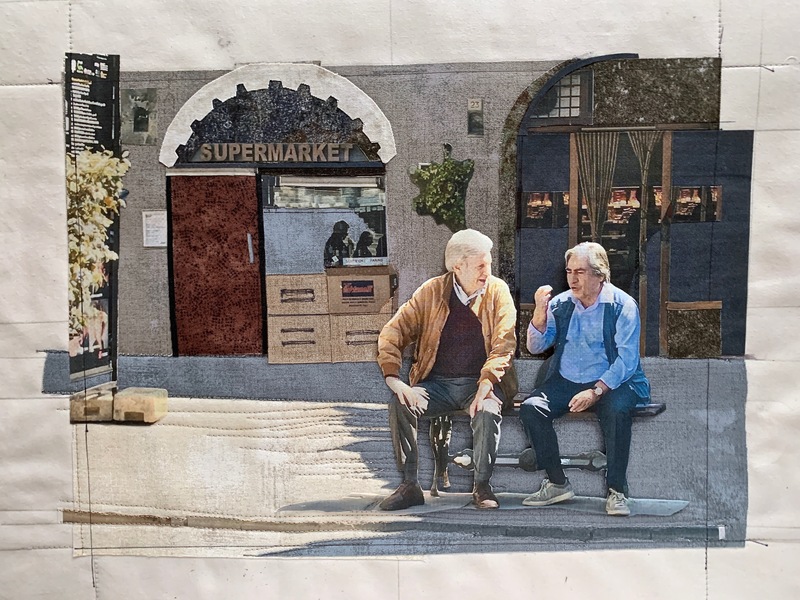 The shop windows are the big challenge – the shops are both dark inside, but there is some light. 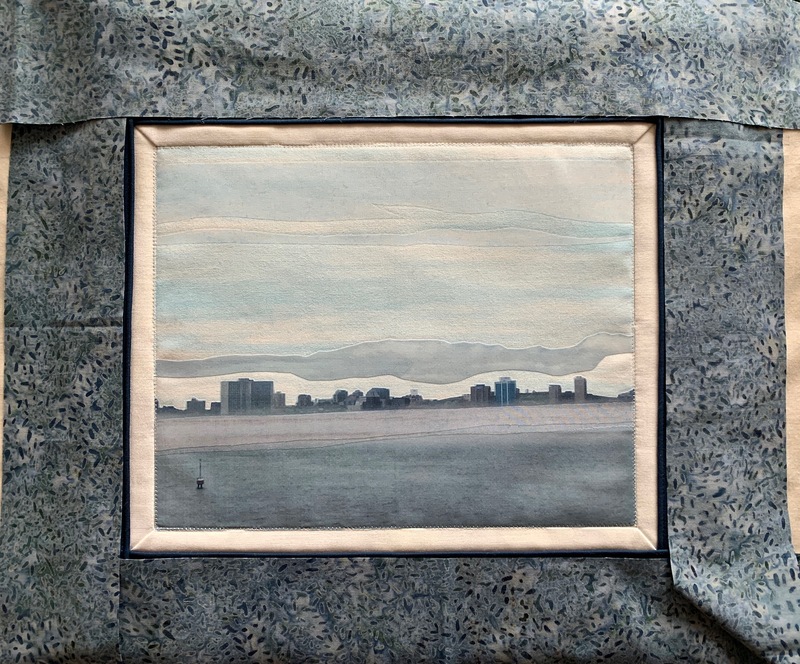 I originally thought I’d be able to use organza to hint at the glazing, but it obscures what’s behind it – great for implying fog but not so good for glass windows. Small bits of plastic might work – the question is how to adhere them to the underlying fabric! 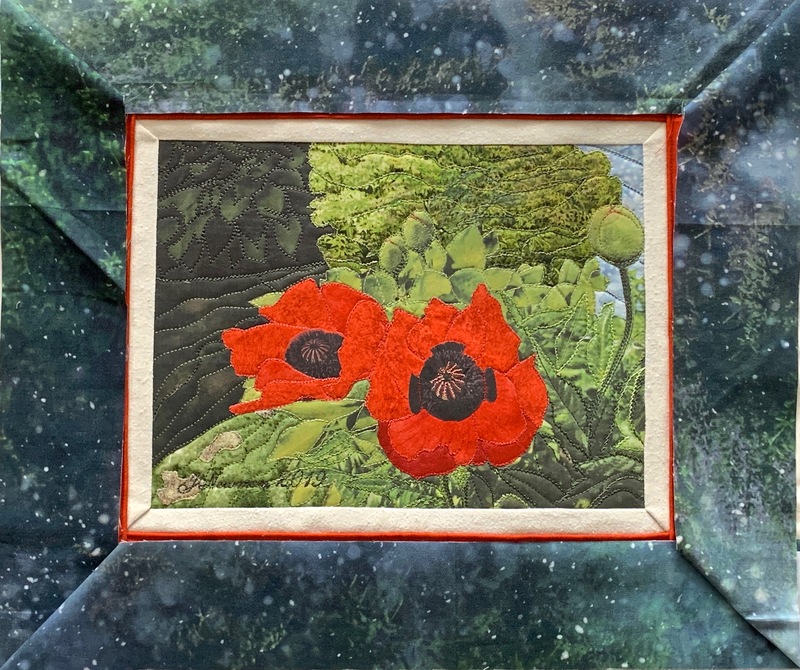 For now, my plan is to continue adding background elements – a couple more and then some thread painting to stitch the fused sections to the base and to add texture to the stones and pavement. 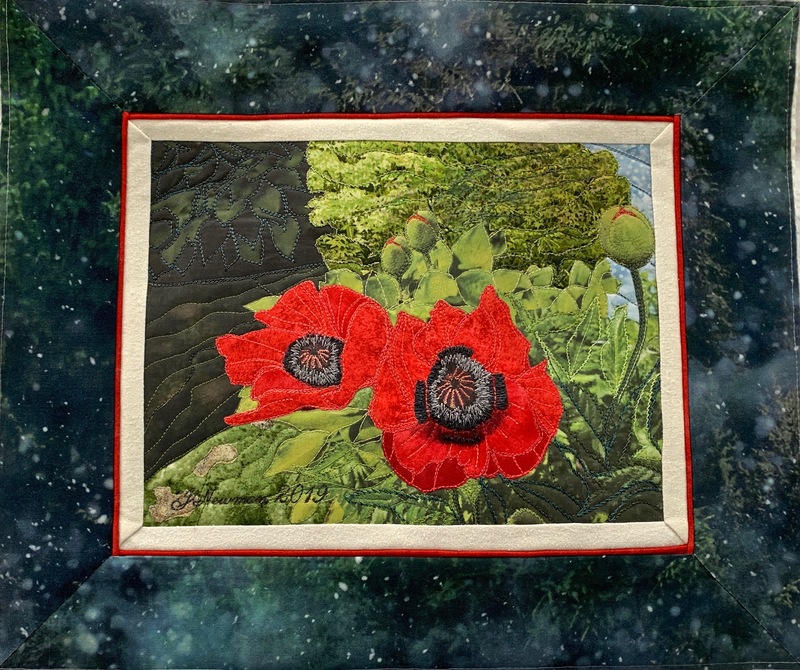 To begin – yesterday I completed Poppies – backing, hidden binding – all done. When I stand back from the finished piece, I’m pleased with how it turned out. I wasn’t sure along the way that I wasn’t going to scrap the whole thing, but after finding a fabric I thought would work as an outer border and overstitching some of what I’d done with blue embroidery thread, I feel the whole piece ties together. 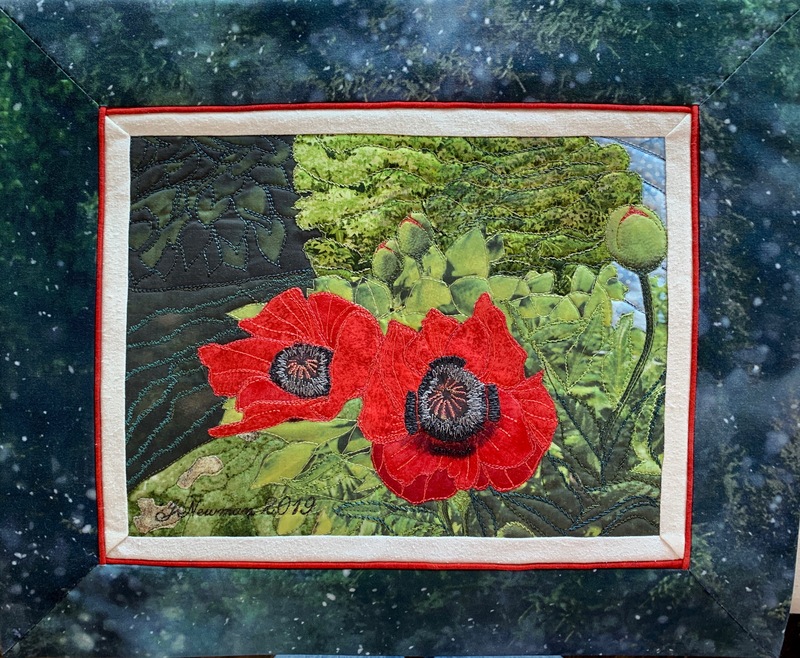 I’m particularly happy with the poppy centres – the texture there worked well. 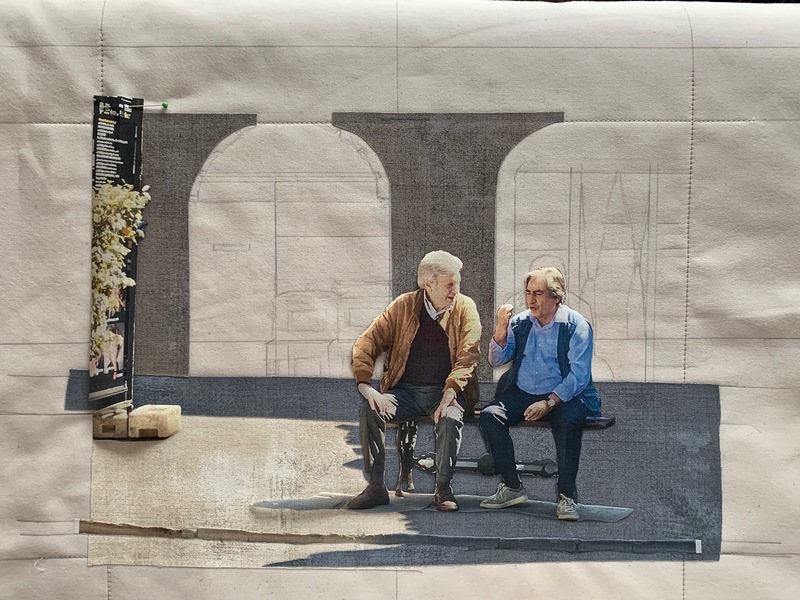 Today I turned to the second project – two men enjoying a sunny morning in the public square in Cortona, Tuscany. 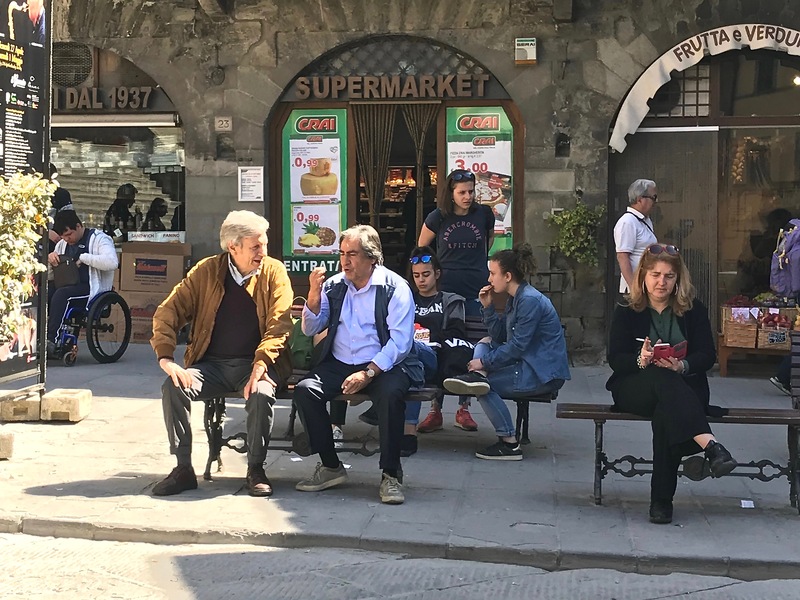 What captivated me when I took the photo was the gesture of the gentleman in the blue shirt – an absolutely Italian way of signalling I’m saying something important (and if you look closely at his other hand you’ll see a cigarette!). 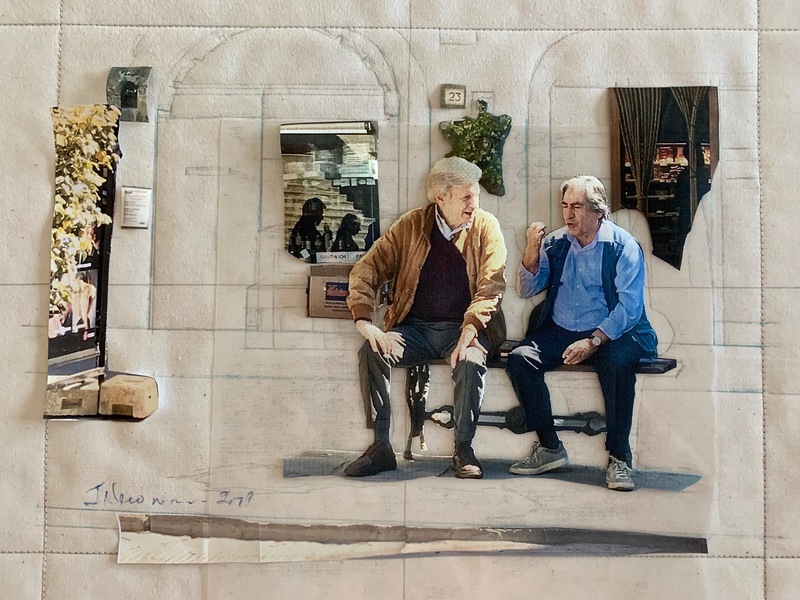 When I laid out the piece, I moved the men from the left to the right side – it’s a balance issue – I felt the focus on the speaker was cut off when the men are positioned on the left – on the right, he’s open to the rest of us. That move has meant I needed to reposition shop windows. In removing all the other people I’ve had to emphasize the hanging plant on the wall behind the men, the sign and tree bordering the left edge. I still have to figure out how to make the windows (without the advertising) work I a believable way. All challenges to be resolved. As always, it’s a matter of working from far to near, building up layers of fabric so the overlaps work. The last piece to be added will be them men themselves. I picked out fabrics from my stash that I think will emulate the colour combinations in the photo. I will likely use marker on the grey grunge fabric to suggest the stone structure as a basis for thread painting detail. I’ve cropped the top of the shop windows so I don’t have to worry about store names, although I plan on placing the awning on the shop to the left. The photo has served as inspiration – I’m not copying it exactly but by rearranging the elements I’m creating an image that feels more focused and balanced and less frenetic. I was at the fabric shop this afternoon to pick up some thread to thread paint the poppies – I didn’t have any good peach/orange red tones in my collection – I want to transform the blue-red colour of the appliqué to a more orange red, and while I was there I happened across a largish wall panel half of which was a blurred blend of blues/greens which I think will work better than the green fabric I bought last week. I’ve pulled out some dark blue and teal threads from the collection to overstitch the dark green areas and connect them to the border fabric. 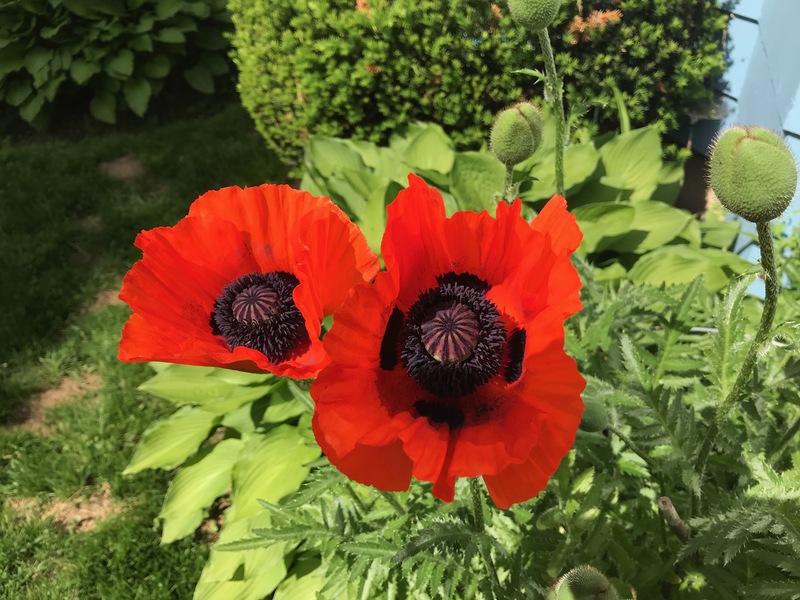 And now I can get to work on the poppies themselves. It’s hard to tell precisely what the colours are from the photo which makes the greens very green and the border blues more blue than they actually are. I do believe the tones in that border fabric as I see it in natural light will liven up the whole piece.